Our bamboo panels are imported directly from Bali, Java and China and handcrafted from sustainably managed bamboo resources. Transform your garden, home interior or landscaping with our durable and sustainable bamboo fencing panels. Bamboo screens are an eco-friendly alternative to wood and naturally resistant to rot and termites, as well as providing an aesthetically pleasing alternative to traditional fencing panels or screens. 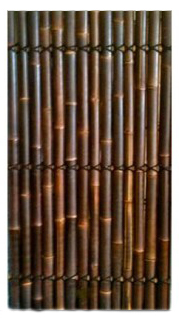 Bamboo fencing adds elegance to any landscape or interior setting and can even be used on ceilings, as wall coverings and to decorate your home with a touch of exotic beauty. If you are looking for high quality bamboo panels or fencing, we import directly from Bali, Java and China, our products are available to purchase direct from our warehouse at a fraction of the price you would expect to pay anywhere else. Our naturally inspired bamboo panels are available in a variety of ready-made sizes from 180 – 200cm lengths. Simply visit our store today to view our selection of bamboo panels or browse our selection of bamboo panels below.